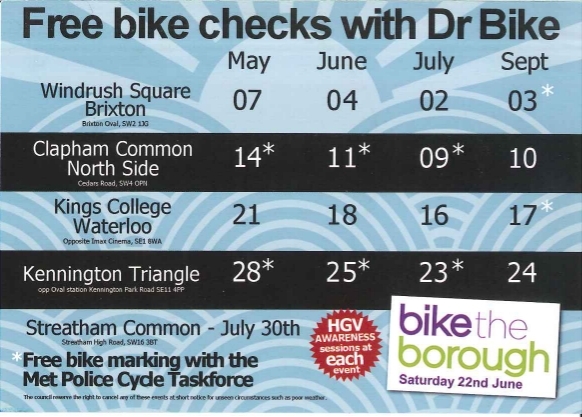 Come and get a safety check and adjustments to your bike as well as information and advice this evening, 9 July 2013, on Clapham Common Northside (opposite Cedars Road), SW4. The Police will also be securely marking bikes and offering advice on how to stop your bike being stolen. 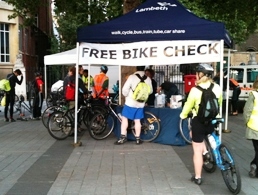 Lambeth's fantastic Sustainable Transport Team will once again be running Dr Bike events at locations across Lambeth every Tuesday over the summer. Come along from 5:30-7:30pm on Tuesdays in Brixton, Clapham, Waterloo and Kennington for a free safety check from an expert bike mechanic and lots of friendly advice on cycling and cycle training.